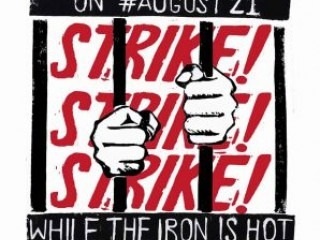 Tomorrow, August 21st, there will be another nation wide Prison Labor Strike. The Strike, which is slated to last until at least September 9th, mirrors a strike that began on the date this one ends in 24 states in 2016, with over 24,000 prisoners participating. One of the organizations that initiated the 2016 strike, the Incarcerated Workers Organizing Committee (IWOC) of the Industrial Workers of the World (IWW), has joined with the Jailhouse Lawyers Committee to organize the work stoppage and put forth the demands for the prisons in 17 states that are planning on participating this year. The past and near-future strike center on around the provisions of the 13th amendment to the Constitution, which allows the enslavement of people convicted of crimes. Noting that this year the massive outbreak of wildfires in California and elsewhere in the west has lead to tens of thousands of prisoners being used to fight fires under dangerous conditions for less than $10 per day, the groups have made a comprehensive list of demands. During the 2016 strike, which was timed to harvest the crops grown in Alabama's vast network of prison plantations with the slogan “Let the crops rot in the fields,” organizers noted the economic power of prison labor. Prisoners generate billions in profit around the country from their unpaid labor, and without their work prisons would have no food, housekeeping, laundry and loose most administrative services. Big pharmaceutical companies, make tremendous profits from using a mixture of overseas and prison labor to make and package life sustaining insulin and related products. They pay less than $1 per hour and charge the average patient over $600 per month. Slavery and the threat of death go hand in hand. There have been some fears and un-elaborated talk of contingency due to threatened and planned response from prison officials in some states. The prisoners in each prison will determine how long each strike will last, but all have committed to Hunger Strikes, Sit-ins and Work Refusal. The fourth tactic, boycott of prison privileges will be adhered to less stringently where concerns family and legal visitations. 5. An immediate end to the racial overcharging, over sentencing, and parole denials of Black and brown humans. Black humans shall no longer be denied parole because the victim of the crime was white, which is a particular problem in southern states. 10. The voting rights of all confined citizens serving prison sentences, pretrial detainees, and so-called “ex-felons” must be counted. Representation is demanded. All voices count. This national prison strike has had two years of discussion within the prisons as to how and what is to be done as well as when and why. That is two years of lessons learned after an almost two week strike that took two years to prepare the first time. Supporters organized by over 50 endorsing organizations including nearly a dozen individual local Democratic Socialist Alliance committees, have pledged some form of material support. Heavy organizational investment has been made in IWOC by the IWW over the last two years. This means that a faction of the Democratic Party with national electoral frontrunners has thrown it's weight behind the largest radical union in the country to support the grassroots organizing of local and state wide prisoners groups on an effort that will last years in some form. This publication will monitor the results.